Brush well for National Dental Hygiene Month! The holidays are full of tasty treats. However, they’re also full of sugar. Not only are they bad for your waistline, but they’re also bad for your teeth. October is National Dental Hygiene Month. Celebrate the occasion by brushing up on your oral hygiene knowledge. That way you can have clean, healthy teeth all through the holiday season and beyond. 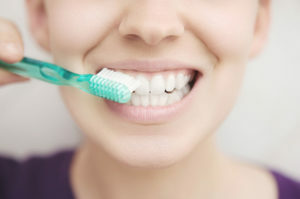 Check out these dental hygiene tips to keep your mouth healthy. When it comes to your oral health, it’s no secret that a toothbrush and floss can help keep your teeth in great condition. These tools help to remove harmful plaque from your teeth as well as promote good gum health. In turn, you reduce your chances of oral diseases such as gingivitis and tooth decay. Ensure that you brush at least two per day, especially after meals, and that you floss at least once per day. The foods you eat play a big part when it comes to your oral health. Sticky, sugary, and acidic foods put stress on your teeth and can be cause for weak enamel that increases your risk for tooth decay. Fortunately, there are foods that can help to keep your teeth (and the rest of your body) in great shape. Eat a balanced diet full of protein, whole grains, and plenty of fruits and vegetables to keep your mouth clean. Regular care is necessary to keep your teeth healthy. Visit your dentist at least once every six months so that a professional can check up on your teeth. That way if you have any issues they can take care of them before they get out of hand. Follow these dental hygiene tips so that you can have a clean, healthy mouth. Ensure that your health comes first year round with the right insurance. Contact the professionals at Robert J. Los Insurance Agency to find you the right insurance. Located in Hamburg, New York, we serve all your personal and commercial insurance needs.